[ Vita Sackville-West ] Small Printed Card Signed in her hand "Vita. | For Diana and Nigel"
White Card, 6 x 4.5cm, a little grubby but otherwise good condition. Printed text as follows: "I am going abroad so am not sending Christmas cards this year, but I should not like you to think I had forgotten you." Followed by her signature etc (as detailed above. [Baptist Wriothesley Noel, evangelical clergyman.] Autograph Letter Signed ('Baptist W Noel') to unnamed female, explaining that he 'cannot aid the circulation of a book without knowing its principles'. 'Walthamstow | 18th April [no year]'. 1p., 4to. In fair condition, on lightly-aged paper, with traces of mount on blank reverse, and short closed tear in one corner. He apologises for having to 'hesitate' regarding her 'slight request', but he 'cannot aid the circulation of a book without knowing its principles'. He continues: 'I rejoice to hear that your daughter & yourself, are still seeking to secure your highest interests'. [Thomas Macwhirter, bookseller.] Manuscript itemised invoice for medical books, headed 'Mr. Thos. Macwhirter | To A. Barklimore'. With signed receipt at foot by the surgeon Archibald Barklimore. Archibald Barklimore (d.1851), surgeon, Charlotte-street, Bloomsbury, London; Thomas Macwhirter (London medical bookseller? Macwhirter's invoice for books purchased on 26 April 1814 and 31 March 1818. Barklimore's receipt dated 25 April 1818. One one side of 16 x 11 cm piece of ruled paper. In good condition, lightly aged and worn. The invoice is for six books totalling £3 17s 0d, the first three purchased in 1814 and the others in 1818: 'Abernethy's Works', '[Abernethy's] Lectures', 'Hey's Lectures', 'Adam's life of Hunter', 'Scudamore on Gout', 'Reid on Insanity'. Barklimore's receipt reads: 'Resd. [sic] 25th. April 1818 from Mr Dunlop | Archd. Barklimore'. Docketted on reverse: Mem[orandu]m of Disbursements on acct Dr. McWhirter by Dr. Barklimore.' Macwhirter does not feature in BBTI. [Robert Peake, London coach builder, father of Archibald Henry Peake, Premier of South Australia.] Printed handbill with anecdotes, a poem ('The Troubles of Lord Alphonsius Fitz Noodle'), and two jeux d'esprit. 2pp., 12mo. 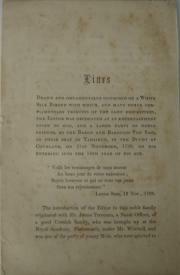 Printed on facing pages on one side of a landscape 8vo leaf, with blank reverse. In fair condition, on aged paper, laid down on part of a leaf removed from an album. The left-hand page carries three items: 'The Confidence Trick. A scene in Oxford Street.' (a series of puns with a purpose now lost, beginning 'A stout "Nave," | Met a green "Felloe"'), 'Anecdotes of the old Coaching Days' (beginning 'Talleyrand bought a new coach, but did not pay for it.') and 'Lord Lyndhurst'. The last reads in full: 'Ordered Robert Peake to build him a Chariot. It was finished and approved of. Two Autograph Drafts of reviews and one Autograph Letter Signed to Philip Dossé of Hansom Books, Artillery Mansions, 75 Victoria Street, London SW1. Both reviews undated [both c. 1974]. Letter of 14 March 1974; 601 Mountjoy House, Barbican, London, on cancelled House of Commons letterhead. All three items lightly aged but good. Driberg has written 'TOM DRIBERG' at the head of the first page of both reviews. First Review (8vo, 7 pp) with slight wear at head (not affecting text) of first four leaves; last three leaves on House of Commons letterheads. With corrections. The subject is Daphne Fielding's 'The Rainbow Picnic' (1974). Second Review (8vo, 7 pp, on House of Commons letterheads) of four books about crossword puzzles, including Roger Millington's 'The Strange World of the Crossword' (1974). With corrections. 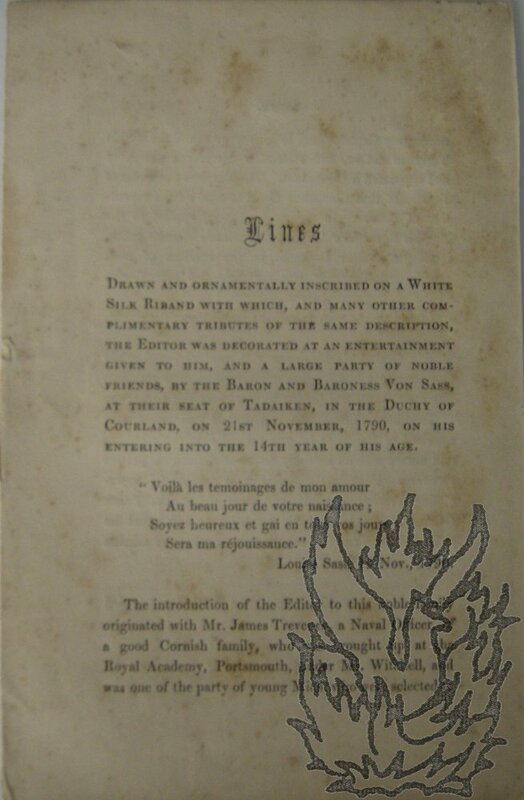 Lines Drawn and ornamentally inscribed on a White Silk Riband with which [...] the Editor was decorated [...] by the Baron and Baroness Von Sass, at their seat of Tadaiken, in the Duchy of Courland, on 21st November, 1790, [...]. 12mo: 8 pp. Leaf dimensions 18 x 11.5 cm. Unbound. Stitched as issued. Good, on lightly-aged paper with foxing to first page. Complete: paginated  to 8, and with 'Finis.' at the end.